2 years import duty exemption; or directly apply for 4 years for companies using locally-produced machines (min. 30%). Not yet being locally produced. If the local machines are available, yet unable to fulfill criteria of required machines. If the local machines are available, yet unable to fulfill the total required machines. 30 % of investment value 145 business fields Eligible for tax allowance, expanded from 143 segments in the previous regulation with additional segment: textile industry. Under certain requirements among others: investment value or export orientation, manpower absorption, local content, and project location (especially outside Java island). Deduction of net corporate income which amount 30% from total investment, carried over 6 years period (equal to 5% deduction per year). The Minister of Finance (MoF) has issued an updated Tax Holiday policy through Regulation No. 150/PMK.010/2018 on 27 November 2018. This regulation revokes the MoF Regulation No. 35/PMK.010/2018. 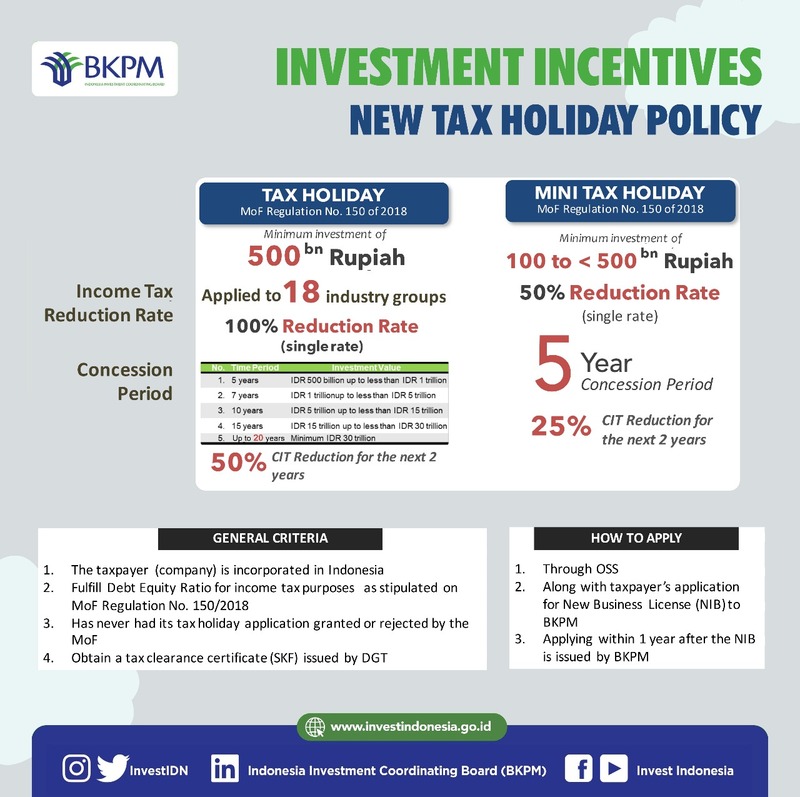 The Corporate Income Tax reduction can be given for 5 - 20 fiscal years, based on investment value and eligible for projects that considered strategic for the Indonesian economy.